Spring is finally here, even though we can�t really complain about the winter we had in Denver this year; it wasn�t all that bad! My friends and family in my hometown state of Illinois suffered a worse fate, their winter was very cold and snowy, thanks to the newly coined term �polar vortex�. But the snow is melting, the trees are budding and flowers are popping up on a daily basis. One of my favorite places in Colorado is Palisades and Grand Junction, also known as the Grand Valley. The Colorado River (the river that runs through the Grand Canyon) runs through the middle of the valley, making this valley some of the most fertile soil in our state. Agriculture is HUGE business in this area, including orchards and vineyards. Colorado is fast becoming known for its peaches and wines that are produced in this area. In fact, this area was named one of the top 10 wine travel destinations in the United States and fast gathering momentum on the global wine stage. I love to photograph in this area! Each season has a wealth of subject matter that I enjoy clicking off 100′s of images. The summer, growing season and fall, harvest season have been favorites for obvious reasons. I have learned so much about the business of growing grapes for wine and growing peaches, plums, cherries, apples and pears in orchards. It is fascinating to see how vineyard and orchard owners bring food and drink to our tables. Catching the orchards in spring bloom has been on my photo bucket list for a while. Last year mother nature had the final word about the spring bloom in the orchards; by delivering spring snowstorms and freezing weather that killed half the orchard crop in the valley. This year was a completely different story, I was bound and determined to get to see the orchards blooming in the Grand Valley! 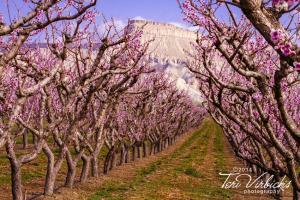 Last weekend, myself and several photographer friends made the trek to Grand Junction to check out the orchards. YESSSSSS, we were treated to a valley in various stages of pink and white! But we also learned a TON of information about growing peaches and apples. My vision of getting an image of the whole valley in �bloom� was quickly corrected, as I became educated about the business of peaches. As we drove up and down the roads in the valley, we encountered a gentleman who was gracious enough to let us photograph his orchard. He then came over and started to chat peaches with us. Again, I was expecting to see rows and rows of trees full of pink and white blooms, and he explained that what we were photographing was �full bloom� for a peach orchard (see the image in this post). We learned that growing fruit is a very labor intensive business, from removing blooms, to picking the final crop; everything is done by hand! The trees are trimmed/pruned at the beginning of each season, so they can be harvested from the ground. Whewwwww, who knew! For this reason, the orchards are planted by variety, so they bloom and produce fruit at different times. Well, this makes TOTAL SENSE once you know that everything in the orchard is done essentially by hand. Plus, different fruits bloom at different times as well. Apricots were pretty much done, by the time we were there, peach and cherry varieties were next and apples and pears were just starting to bloom. According to our orchard host, the entire process takes place over a 3 to 4 week period. Then there is Mother Nature, if she decides winter isn�t done yet for the year, that can greatly affect the blooming crop and impact the quantity of fruit for harvest. One of the major initiatives of the Colorado Tourism Office is to raise awareness of and appreciation for Colorado�s heritage tourism assets. By partnering with the Colorado Department of Agriculture, the CTO has initiated an agritourism program that will showcase Colorado�s agriculture roots and current opportunities for visitors to experience agriculture in the state. Agritourism covers a wide variety of recreational, educational and other leisure activities and services, provided by farmers and ranches and experienced by consumers who value the activity or service they receive and seek it out. Agritourism may be defined as activities, events and services related to agriculture that takes place on or off the farm or ranch, and that connects consumers with the heritage, natural resources or culinary experience they value. Whether you visit a farm, shop at a farmers� market or tour a winery, you are helping support Colorado�s agriculture industry. The people of the Grand Valley are AMAZING and some of warmest and friendliest people you will ever meet! They are always willing to stop and share with you how the pretty pink blooming trees become fresh juicy peaches in your grocery store later in the summer. If you have never had a Colorado Peach or a glass of Colorado Wine, I encourage you to give them a try. They are some of the yummiest treats our planet has to offer! I can�t want until harvest time, YUMMMMMM! Thanks Grand Valley, see you at harvest time!